The arts have always served as the distinctive vehicle for discovering who we are. Providing ways of thinking as disciplined as science or math and as disparate as philosophy or literature, the arts are used by and have shaped every culture and individual on earth. They continue to infuse our lives on nearly all levels generating a significant part of the creative and intellectual capital that drives our economy. The arts inform our lives with meaning every time we experience the joy of a well-remembered song, experience the flash of inspiration that comes with immersing ourselves in an artistic sculpture, enjoying a sublime dance, learning from an exciting animation, or being moved by a captivating play. The central purposes of education standards are to identify the learning that we want for all of our students and to drive improvement in the system that delivers that learning. Standards, therefore, should embody the key concepts, processes and traditions of study in each subject area, and articulate the aspirations of those invested in our schools students, teachers, administrators, and the community at large. 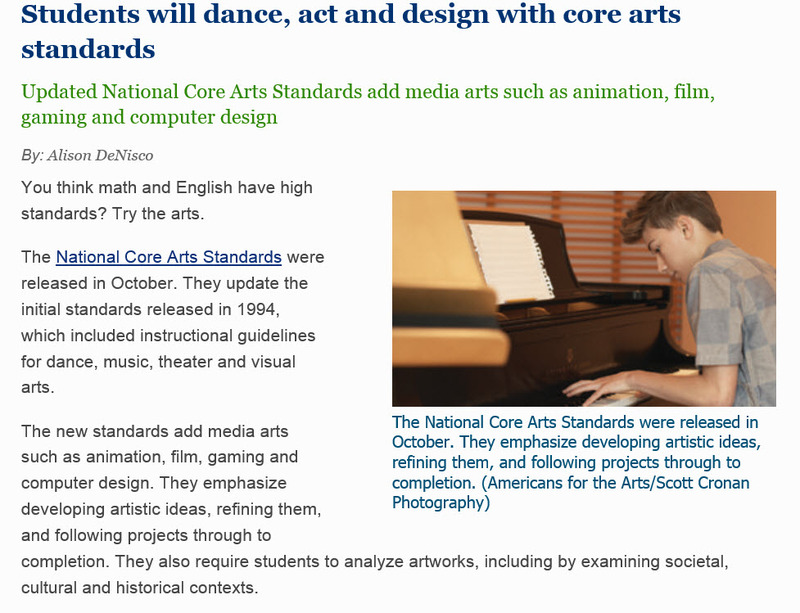 To realize that end goal, these new, voluntary National Core Arts Standards are framed by artistic literacy, as outlined in philosophical foundations, lifelong goals, and artistic processes; articulated as anchor and performance standards that students should attain; and supported by instructional resources, including model cornerstone assessments that illustrate how literacy might be measured. The connective threads of this conceptual framework are designed to be understood by all stakeholders and, ultimately, to ensure success for both educators and students. Anchor Standards which are common across all five of the arts disciplines. 1. The standards provide the foundation for visual art education for all students. The standards support student-learning outcomes through big ideas, enduring understandings and essential questions. The concepts embedded in the standards reflect the scope of learning the knowledge, skills, and understandings - taught through study of the visual arts. By including all aspects of creating, presenting, responding, and connecting in study of the visual arts, student learning through these standards explores the full scope of what it means to be an artistically literate citizen. While presented chronologically the processes are best designed and taught in a blended fashion to support rich artistic skills and behaviors. Anchor Standard: Synthesize and relate knowledge and personal experiences to make art. Enduring Understanding: Through art-making, people make meaning by investigating and developing awareness of perceptions, knowledge, and experiences. Essential Question: How does engaging in creating art enrich people's lives? How does making art attune people to their surroundings? How do people contribute to awareness and understanding of their lives and the lives of their communities through art-making? Generate a collection of ideas reflecting current interests and concerns that could be investigated in art-making. Individually or collaboratively create visual documentation of places and times in which people gather to make and experience art or design in the community. Make art collaboratively to reflect on and reinforce positive aspects of group identity. Anchor Standard: Relate artistic ideas and works with societal, cultural, and historical context to deepen understanding. Enduring Understanding: People develop ideas and understandings of society, culture, and history through their interactions with and analysis of art. Essential Question: How does art help us understand the lives of people of different times, places, and cultures? How is art used to impact the views of a society? How does art preserve aspects of life? Analyze how art reflects changing times, traditions, resources, and cultural uses. Distinguish different ways art is used to represent, establish, reinforce, and reflect group identity. Anchor Standard: Generate and conceptualize artistic ideas and work. Essential Question: What conditions, attitudes, and behaviors support creativity and innovative thinking? What factors prevent or encourage people to take creative risks? How does collaboration expand the creative process? Apply methods to overcome creative blocks. Document early stages of the creative process visually and/or verbally in traditional or new media. Essential Question: How does knowing the contexts histories, and traditions of art forms help us create works of art and design? Why do artists follow or break from established traditions? How do artists determine what resources are needed to formulate artistic investigations? Formulate an artistic investigation of personally relevant content for creating art. Collaboratively shape an artistic investigation of an aspect of present-day life using a contemporary practice of art and design. Anchor Standard: Organize and develop artistic ideas and work. Enduring Understanding: Artists and designers experiment with forms, structures, materials, concepts, media, and art-making approaches. Essential Question: How do artists work? How do artists and designers determine whether a particular direction in their work is effective? How do artists and designers learn from trial and error? Demonstrate openness in trying new ideas, materials, methods, and approaches in making works of art and design. Demonstrate persistence in developing skills with various materials, methods, and approaches in creating works of art or design. Demonstrate willingness to experiment, innovate, and take risks to pursue ideas, forms, and meanings that emerge in the process of art-making or designing. Enduring Understanding: Artists and designers balance experimentation and safety, freedom and responsibility while developing and creating artworks. Essential Question: How do artists and designers care for and maintain materials, tools, and equipment? Why is it important for safety and health to understand and follow correct procedures in handling materials and tools? What responsibilities come with the freedom to create? Explain environmental implications of conservation, care, and clean-up of art materials, tools, and equipment. Demonstrate awareness of ethical responsibility to oneself and others when posting and sharing images and other materials through the Internet, social media, and other communication formats. Demonstrate awareness of practices, issues, and ethics of appropriation, fair use, copyright, open source, and creative commons as they apply to creating works of art and design. Essential Question: How do objects, places, and design shape lives and communities? How do artists and designers determine goals for designing or redesigning objects, places, or systems? How do artists and designers create works of art or design that effectively communicate? Design or redesign objects, places, or systems that meet the identified needs of diverse users. Apply visual organizational strategies to design and produce a work of art, design, or media that clearly communicates information or ideas. Select, organize, and design images and words to make visually clear and compelling presentations. Anchor Standard: Refine and complete artistic work. Enduring Understanding: Artist and designers develop excellence through practice and constructive critique, reflecting on, revising, and refining work over time. Essential Question: What role does persistence play in revising, refining, and developing work? How do artists grow and become accomplished in art forms? How does collaboratively reflecting on a work help us experience it more completely? Reflect on whether personal artwork conveys the intended meaning and revise accordingly. Apply relevant criteria to examine, reflect on, and plan revisions for a work of art or design in progress. Anchor Standard: Select, analyze and interpret artistic work for presentation. Enduring Understanding: Artists and other presenters consider various techniques, methods, venues, and criteria when analyzing, selecting, and curating objects artifacts, and artworks for preservation and presentation. Essential Question: How are artworks cared for and by whom? What criteria, methods, and processes are used to select work for preservation or presentation? Why do people value objects, artifacts, and artworks, and select them for presentation? Analyze similarities and differences associated with preserving and presenting two-dimensional, three- dimensional, and digital artwork. Develop and apply criteria for evaluating a collection of artwork for presentation. Anchor Standard: Develop and refine artistic techniques and work for presentation. Enduring Understanding: Artists, curators and others consider a variety of factors and methods including evolving technologies when preparing and refining artwork for display and or when deciding if and how to preserve and protect it. Essential Question: What methods and processes are considered when preparing artwork for presentation or preservation? How does refining artwork affect its meaning to the viewer? What criteria are considered when selecting work for presentation, a portfolio, or a collection? Individually or collaboratively, develop a visual plan for displaying works of art, analyzing exhibit space, the needs of the viewer, and the layout of the exhibit. Based on criteria, analyze and evaluate methods for preparing and presenting art. Collaboratively prepare and present selected theme-based artwork for display, and formulate exhibition narratives for the viewer. Anchor Standard: Convey meaning through the presentation of artistic work. Enduring Understanding: Objects, artifacts, and artworks collected, preserved, or presented either by artists, museums, or other venues communicate meaning and a record of social, cultural, and political experiences resulting in the cultivating of appreciation and understanding. Essential Question: What is an art museum? How does the presenting and sharing of objects, artifacts, and artworks influence and shape ideas, beliefs, and experiences? How do objects, artifacts, and artworks collected, preserved, or presented, cultivate appreciation and understanding? Assess, explain, and provide evidence of how museums or other venues reflect history and values of a community. Compare and contrast viewing and experiencing collections and exhibitions in different venues. Analyze why and how an exhibition or collection may influence ideas, beliefs, and experiences. Anchor Standard: Perceive and analyze artistic work. Enduring Understanding: Individual aesthetic and empathetic awareness developed through engagement with art can lead to understanding and appreciation of self, others, the natural world, and constructed environments. Essential Question: How do life experiences influence the way you relate to art? How does learning about art impact how we perceive the world? What can we learn from our responses to art? Identify and interpret works of art or design that reveal how people live around the world and what they value. Explain how the method of display, the location, and the experience of an artwork influence how it is perceived and valued. Explain how a person�s aesthetic choices are influenced by culture and environment and impact the visual image that one conveys to others. Enduring Understanding: Visual imagery influences understanding of and responses to the world. Essential Question: What is an image? Where and how do we encounter images in our world? How do images influence our views of the world? Analyze ways that visual components and cultural associations suggested by images influence ideas, emotions, and actions. Analyze multiple ways that images influence specific audiences. Compare and contrast contexts and media in which viewers encounter images that influence ideas, emotions, and actions. Anchor Standard: Interpret intent and meaning in artistic work. Enduring Understanding: People gain insights into meanings of artworks by engaging in the process of art criticism. Essential Question: What is the value of engaging in the process of art criticism? How can the viewer "read" a work of art as text? How does knowing and using visual art vocabularies help us understand and interpret works of art? Interpret art by distinguishing between relevant and non-relevant contextual information and analyzing subject matter, characteristics of form and structure, and use of media to identify ideas and mood conveyed. Interpret art by analyzing art-making approaches, the characteristics of form and structure, relevant contextual information, subject matter, and use of media to identify ideas and mood conveyed. Interpret art by analyzing how the interaction of subject matter, characteristics of form and structure, use of media, art-making approaches, and relevant contextual information contributes to understanding messages or ideas and mood conveyed. Anchor Standard: Apply criteria to evaluate artistic work. Enduring Understanding: People evaluate art based on various criteria. Essential Question: How does one determine criteria to evaluate a work of art? How and why might criteria vary? How is a personal preference different from an evaluation? Develop and apply relevant criteria to evaluate a work of art. Compare and explain the difference between an evaluation of an artwork based on personal criteria and an evaluation of an artwork based on a set of established criteria. Create a convincing and logical argument to support an evaluation of art.